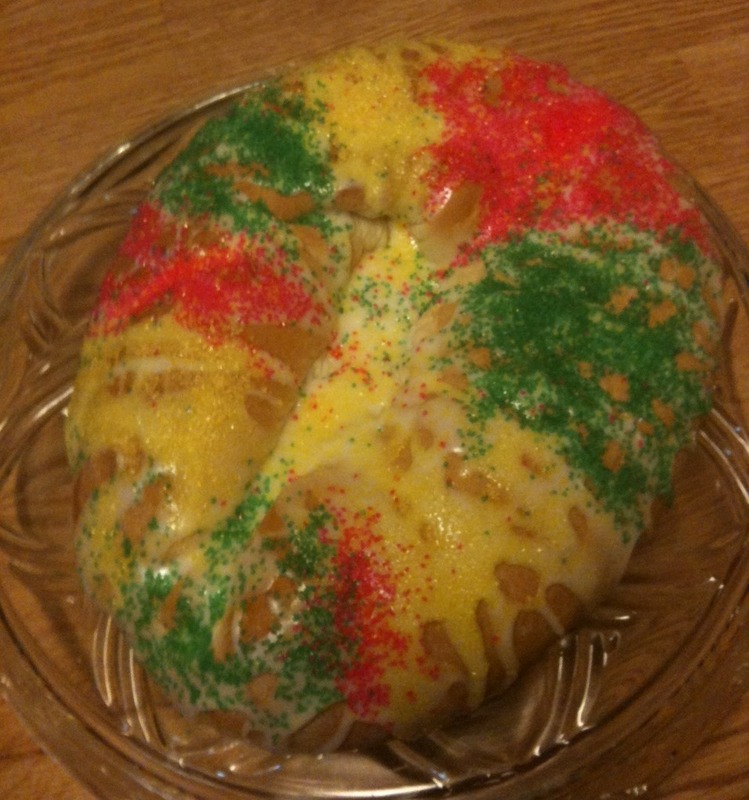 I made our annual king cake today with a recipe from Southern Plate that called for frozen bread dough. It was a cinch to make compared to my traditional recipe, which calls for making the dough, letting the dough rise, punching down the dough, letting the dough rise yet again, rolling and shaping the dough, letting it rise again, baking the cake, and finally decorating the cake. If it sounds like a ton of work that takes all day, you are correct. This recipe calls for adding lemon extract to the cream cheese filling; I associate king cakes with a light cinnamon flavor, so I substituted cinnamon for the lemon. How much cinnamon? A few shakes. This was a cooking-by-taste experiment. If I made it again, I would skip the cream cheese filling altogether and simply coat the dough with butter and cinnamon sugar before rolling it up. Simple is better when it comes to king cakes. Like Southern Plate’s Christy Jordan, I couldn’t find purple sugar at the grocery store, so I ended up with hot pink. I’m pretty sure the cake glows in the dark; I really need to go downstairs and check before the cat freaks out. The ring obviously did not maintain its shape during baking, but it didn’t totally stick together in the middle. The husband’s verdict: It’s OK, but not as good as the make-king-cake-all-day version. My verdict: It’s definitely got a shot without the cream cheese filling. I live in California and my daughter just came back from celebrating Mardi Gras in New Orleans with some high school friends who went to LSU, got jobs and stayed there. Anyway, she brought home a King Cake. I’d never heard of it until today. It seems kinda more like a coffee ring than an actual cake. Am I correct? Thanks for your post about the cake. It was interesting! Yes, a king cake is a lot closer to a coffee ring than what we think of as cake. I understand that king cakes traditionally used a brioche dough. Right now, anything King Cake sounds good to me, even stale King Cake. I’m on my 1300 calorie a day intake and no sugar. I’d give anything to have a bite of King Cake right about now. Starting a diet during Mardi Gras is just as bad as trying to start one at Thanksgiving.